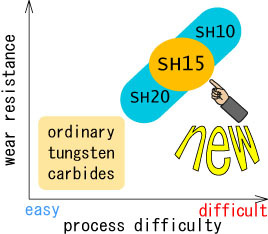 Development of SH15(Super Hard Tungsten Carbide). Super Hard tungsten carbide (SH type) have been got high valuation at wear-resistant tool, dies, powder mold, sandblasting nozzle, because of their property, high wear-resistance and high corrosion-resistance. The nozzle life ,use SH10, is longer than 10 - 100 times longer than traditional tungsten carbides. We had two kind of SH type tungsten carbide (SH10 and SH20). The purpose of development SH10 was pursuing good structure, good wear-resistant and good corrosion-resistant. So, It has good wear-resistant, but it is difficult to process molding. SH20 have more sticky than SH10. SH20 can process molding like ordinary tungsten carbides. SH20 has good wear-resistance, but it cannot be compete with SH10 of cource. Now, we develop SH15 to have wear-resistance like SH10 and good process property like SH20. The position of SH15 is between SH10 and SH20. We think, SH15 will make SH type tungsten carbide applying to another application. You can use SH15 for difficult configuration that cannot process with SH10.